A pair of geese enjoy one of the few snow free spots in Blackville on 4/25/18. Look at the wall of ice across the Miramichi. Deer seemed to make it through fairly well. I saw them around everywhere. The ones I saw beside 295 in Maine actually looked thinner. 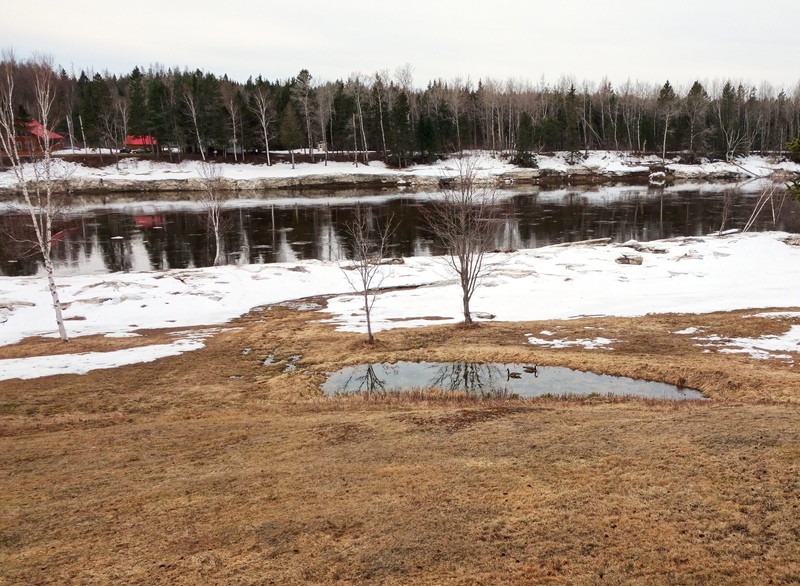 The weather and fishing – Spring has finally come to the Miramichi valley. As those of you living in the Northeast know, it was a crazy winter. We had a snow cover in coastal Maine from virtually the first of December until well into April. 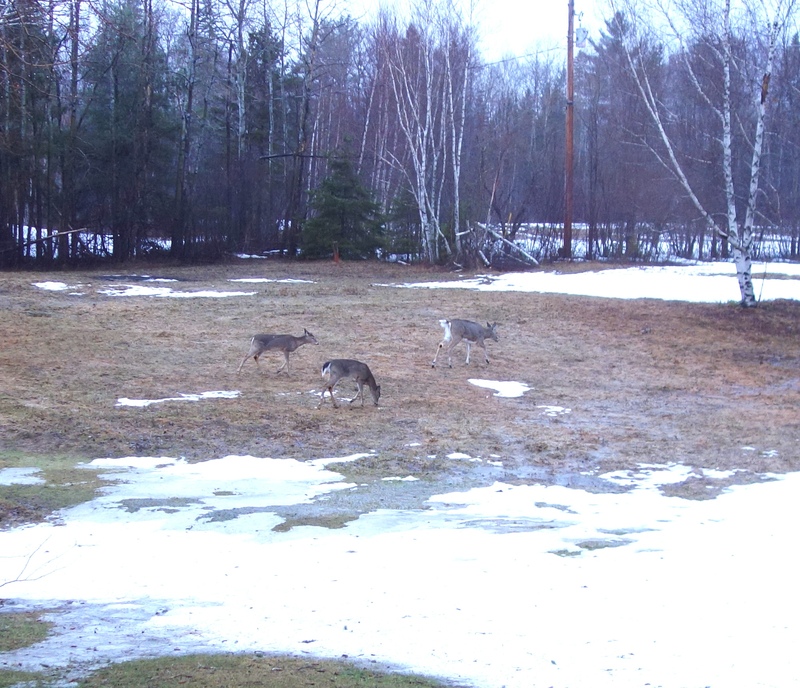 They still have it in parts of inland Maine. One true Blackville gray beard told me that it was the most snow he had seen in the woods this late in the season during his 80 or so years. When I left Blackville yesterday I was still scraping the belly of my truck on snow as I drove out of the driveway. 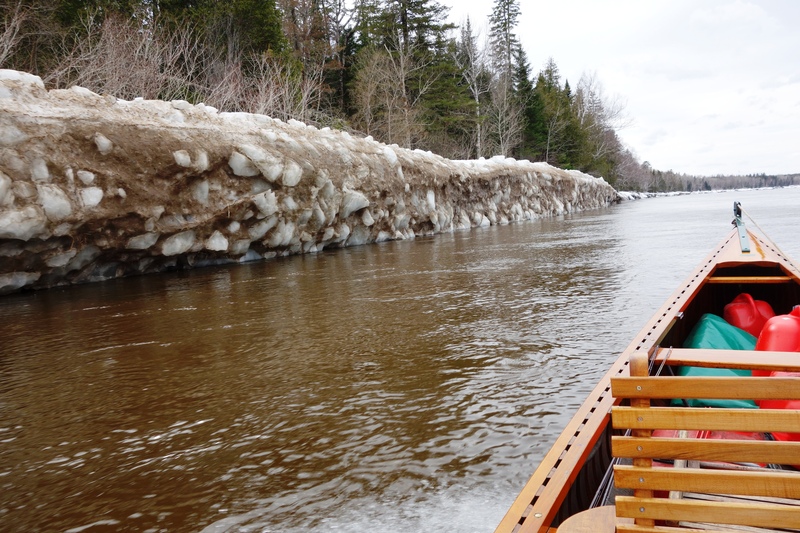 It wasn’t cold all the time, though, and a warm-up during January combined with significant rain caused the Miramichi to rise enough to break loose and run. The thick ice, though, could not get out of the river, and it piled up here and there on the banks and then refroze. Last Wed. 4/25 Jason Curtis took us almost 30 miles up the Cains River, and in the afternoon we went downriver to Doctor’s Island. The evidence of big ice pileups was everywhere. Crazy ice formation from ice jamming, stacking up, and freezing in place. 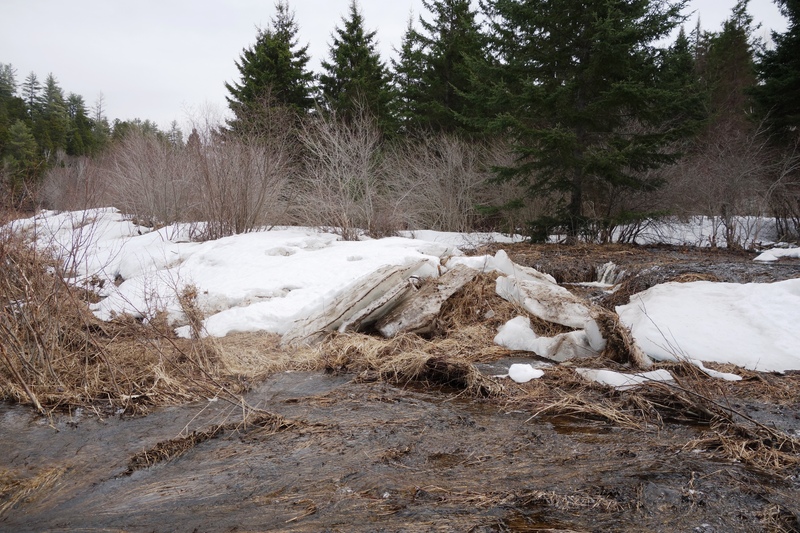 The area of the river near Campbell’s Pool had ice stacked up and bizarrely refrozen along the banks at least 15 feet high, perhaps higher in places. There was nowhere along the river where you could actually keep a boat. Over this past weekend the water rose 15 feet with rain and snow melt. All night long you could hear the crashing of ice falling back into the river. The river was clearing up by yesterday afternoon, but it would still have been dangerous to be out in the river in a boat. Eddie and Rip with a big kelt. There have been very few points in time since the season opened two weeks ago when you could really fish for spring salmon because of either floating ice or high, dirty water. In spite of this some decent catches have been made during the windows of opportunity. 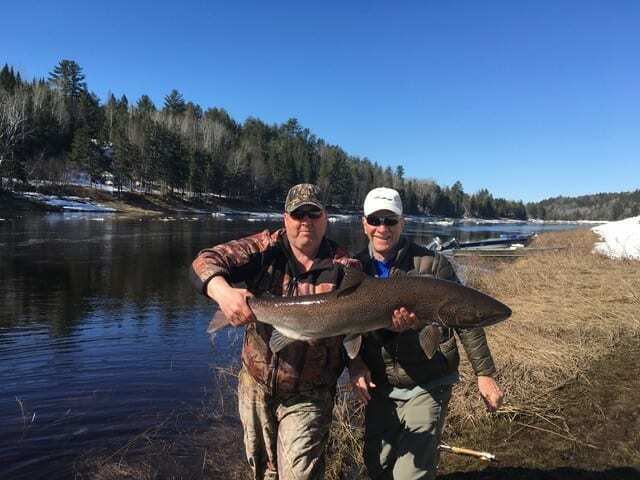 Eddie Colford, head guide at Black Brook is holding a large kelt taken by angler Rip Cunningham. Rip told me that the fish jumped clear of the water several times and peeled off a bunch of backing. Byron Coughlin said that they had a couple of days when everyone at Country Haven caught fish. Then the raises came and dirtied things up. A well chewed Willie Gunn Waddington. 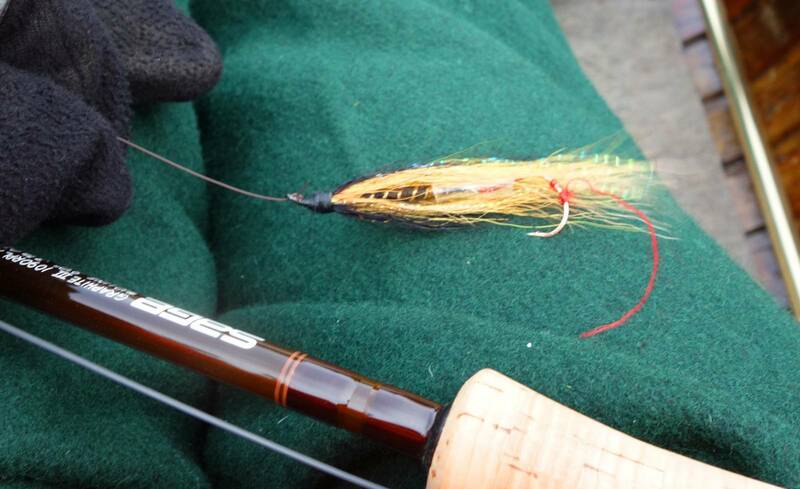 A great kelt – spring salmon – fly. Photographed against a pair of Northland green, wool pants I’ve had since college. Salmon regulations will stay the same as recent years – no retention. With both branches of the Miramichi hosting far less salmon than required to properly seed the river how could we expect to be able to harvest any. Striped bass regulations have been opened up some with a three fish bag limit – still, though, a very tight slot limit – and a reduced area closure for spawning. There is also talk from those who should know that there will be a commercial harvest by First Nations. To me not allowing all striped bass of any size caught to be retained above the head of tide is hard to defend. If a striped bass is caught upriver where it is assumedly feeding on parr it should be removed regardless of size. We hear that one reluctance to loosen striped bass regulations is that the NW Miramichi is the only striped bass spawning area north of Nova Scotia. It is a meaningless argument. That is the biology of striped bass. They don’t spawn in every nook and cranny. On the upper half of the East Coast of the United States the only spawning areas of any magnitude are Chesapeake Bay, the Delaware River, and the Hudson River. Striped bass are incredibly fecund, and if they spawned in nearly every river along the coast like gasperaux – river herring – there would be no living fish but striped bass in the entire coastal zone. 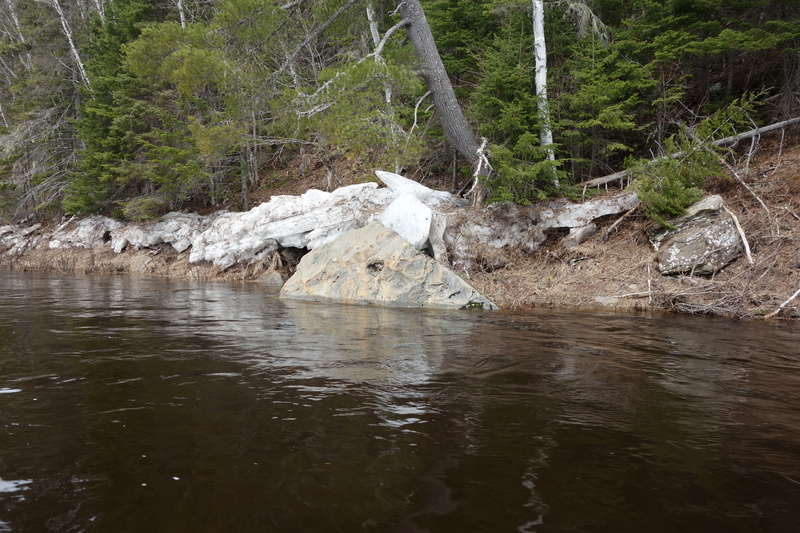 We hear that brook trout numbers are down substantially, gasperaux and shad populations are way off, the once fantastically abundant smelt population of the Miramichi that many creatures depend on has declined to a remnant. I guess that at least the new regulations are steps in the right direction, but they probably aren’t nearly enough to bring the striped bass population back into balance with other species in the Miramichi River. You can read more about the new striper regs here at the MSA site. I spent the winter busier in many ways than I wanted to be. I had two big projects. The first was my new book On the Cains: Atlantic Salmon and Sea-Run Brook Trout on the Miramichi’s Greatest Tributary. It will be published sometime next winter by Stackpole Books. I’ve enjoyed the research and the writing greatly, but everything for the book has needed to be researched, and it has demanded a ton of time and concentration. I still have interviews to do and leads for information and photos to run down. I already have written the minimum text for the book, but still have a full chapter to go and other information to add. It should all be done by the end of July. The plan called for about 120 illustrations and photos. I have over 200 already put together and new ones just keep coming in. Hopefully my editor and publisher will let us expand the size of the book a little. Here is a small example of the information that I have come across. 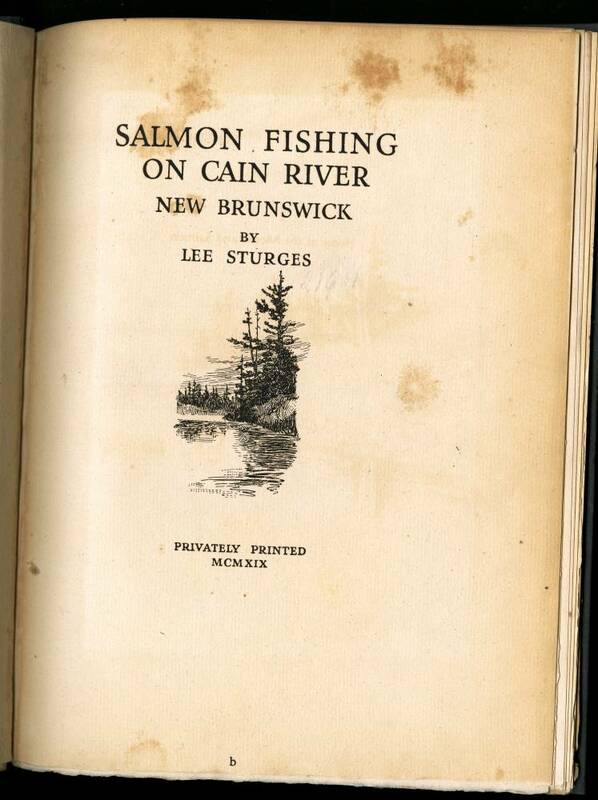 In 1919 Lee Sturges, self-published a small book about a fishing trip a few years earlier with W. Harry Allen down the Cains River. Lee mentions camping and fishing at the Arbeau Pool. 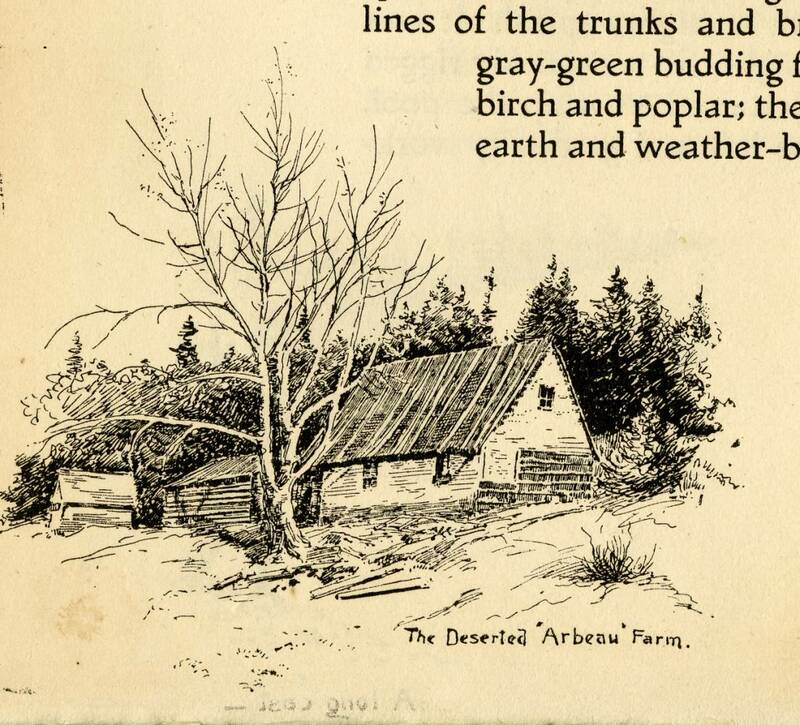 He also drew a picture and made an etching of the long-abandoned, but still standing, farmhouse. In early writing the pool was quite famous, and virtually everything that you read about the Cains mentions the Arbeau Pool. There are definitely people today who know this pool, but not very many. The pool is not listed in any of the Department of Natural Resources pool maps, and everyone who told me where it was gave me a somewhat different answer. I ended up piecing the location together from some hundred year old writing by W. F. Ganong, verbal instructions from Emery Brophy who lumbered there as a teenager more than 60 years ago, from its relative location to the ancient Indian portage route to the Saint John via the Gasperaux that a group of dedicated New Brunswicker canoeing enthusiasts have marked off, and from help with LIDAR technology mapping by Duane Mercer of Natural Resources. I’ll get into all the details in the book, but here some recent photographs and Sturges drawings. Keith Wilson says that the foundation rocks of the farmhouse are just on the downriver side of the stream you see pictured, and up against the trees on the higher ground. That agrees with the maps, but when I tried to walk back there I ran into waist deep snow. I’ll be back and find it this summer. Portage Rock from coming up river. The rock signaled to the Indians and early settlers that the portage trail exited to the left just a short distance upstream. The Arbeau farmhouse drawn above by Sturges stood just across this intervale as the ground started to rise. The low, level ground was all cleared for livestock grazing as it appears in the Sturges drawing. 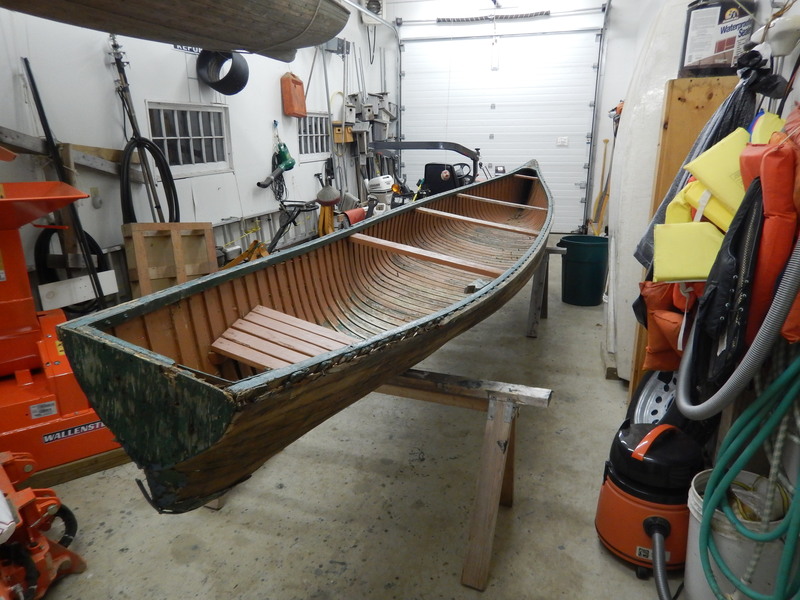 The other project was the rebuilding of a 20’ v-stern Chestnut Ogilvy fishing canoe. My brother Jason – the real craftsman between us – and I have countless hours in this project, but loved almost every minute of it. I posted a lot of details about the work on my bradburnsflyfishing facebook page. 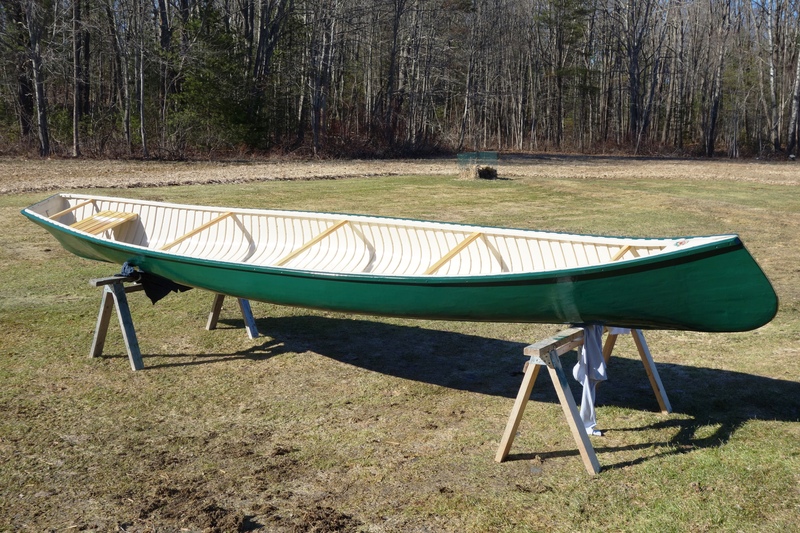 The boat will be heading up to Mahoney Brook on the Cains later on this summer. I’m going to pole it up to the Arbeau Pool. The post Spring Salmon Blog appeared first on Brad Burns Fishing. This is a syndicated post. You can view the original post here: Spring Salmon Blog.